You are here: Home / Natural Fine Planetary Talismans / True Cinnamon color in this lustrous Hessonite Garnet-Rahu Talismanic Ring with magical north node energies Gemstoneuniverse.com! True Cinnamon color in this lustrous Hessonite Garnet-Rahu Talismanic Ring with magical north node energies Gemstoneuniverse.com! Comments A 5+ carats totally treatment free Hessonite with top quality true Cinnamon color, velvety surface, great fire and lustre and a price that leaves one flummoxed. 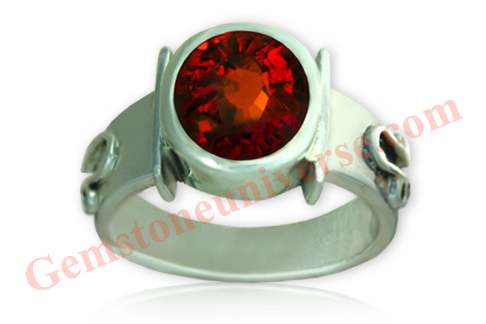 The symbols of the north node also known as the caput draconis are inscribed on the ring shanks to make this ring truly magical.Hessonite Garnet also known as the Cinnamon Stone is the Gemstone of Rahu often referred to as the North Node or the ascending node of the moon. 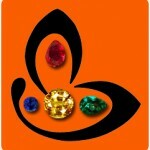 This Gemstone is also known as Gomed/ Gomedhaka in Hindi, Tamil, Sanskrit and Sinhalese. Rahu periods are period of Karmic Challenges and imbalances that come in life to teach us to accept the conditions life and environment gives us and adjust to these conditions. The earlier the individual accepts these limiting conditions the earlier good results start coming. Hessonite brings remarkable results if it suits the individual including giving instant metal relief, freedom from doubt and fear and the ability to let go of negative life patterns and events.